What is the 9.7-inch iPad 2018? The new iPad 2018 is the cheapest tablet in Apple’s range, and it looks just like any other iPad from the past five years. It should be boring. But it isn’t. It packs the powerful A10 Fusion processor, costs just £319/$329 (for the entry-level 32GB Wi-Fi model) and it supports the Apple Pencil. This is an iPad Pro mini in all but name, but is half the price of the 10.5-inch iPad Pro. What’s more, forget cheap laptops; Apple is pitching the iPad 2018 as the future of computing in the classroom – and there’s certainly some truth to its claim. The upgraded processor means you’ll see a significant improvement over any iPad older than the iPad Air 2. If you’re rocking an old iPad that’s sluggish and doesn’t last long on a charge, then this is the time to upgrade without breaking the bank. The new iPad is thin, light and has a sharp, punchy 9.7-inch screen that’s perfect for watching video in bed or on the go. Battery life is solid, offering between 10 and 11 hours of screen time. Playing games reduces this a little, while low-intensity tasks such as browsing the web and sending emails results in it lasting even longer. As a casual tablet, the new iPad is the best you can get for the price. As a full-on laptop replacement, things aren’t quite so simple, but the iPad still makes a solid case for itself. If you’ve seen an iPad at any point in the past few years then the 2018 model won’t surprise you at all. There’s the solid metal chassis, a chunky bezel around the screen and a proper Home button with Touch ID. 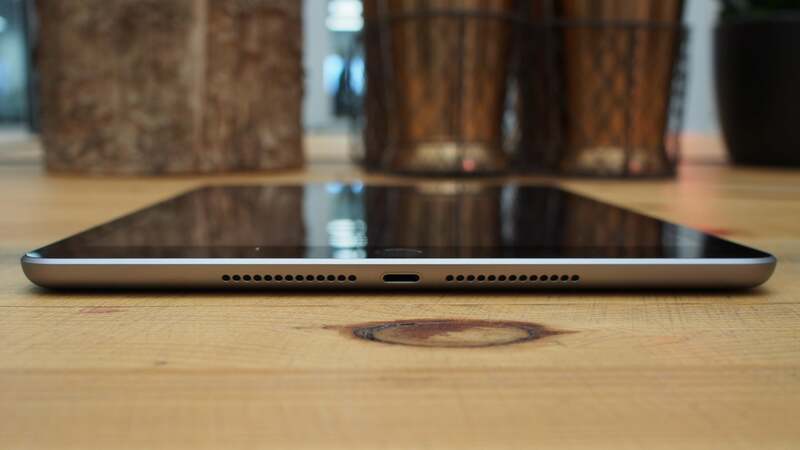 It’s thin, light and great to hold. The IPS 9.7-inch screen isn’t quite on a par with the one on the iPad Pro, but it’s still great for anything other than the most detailed of design or photo- and video-editing work. It isn’t as rich in colour as the OLED-packing Samsung Galaxy Tab 3, but colours are accurate and dark levels decent for an LCD screen. The one downside is that it’s quite reflective and smudges easily with fingermarks. The stereo speakers are fine for watching video, but not a patch on the iPad Pro’s quad-speaker array. They lack bass and depth for listening to music. Data transfer and charging is handled via a Lightning port, and a 3.5mm headphone jack remains – something that’s disappeared from recent iPhones. The screen also not supports the pressure-sensitive Apple Pencil, giving you superb precision when drawing. You can also sketch, take notes, mark up documents or photos, or even use it as you would a mouse pointer. The Apple Pencil is fast, smooth, and a really useful tool that you still don’t find on many laptops. Those hybrid laptops that do support a stylus, such as the Microsoft Surface Pro, are rarely cheap. The only direct tablet competitor is the £500 Galaxy Tab S3, which comes with an S Pen stylus in the box. 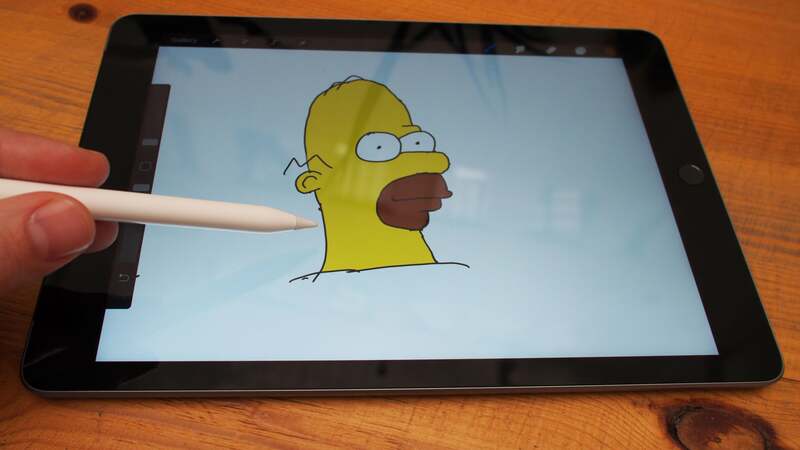 At £89, the Apple Pencil adds a heap of useful features to the new iPad whilst keeping the price well below Samsung’s tab. So the only thing that’s really lacking when comparing this iPad to the 10.5-inch iPad Pro is the smart keyboard connector. If the iPad wants to be a realistic alternative to a laptop then it needs a keyboard. Typing remains a key part of being productive in the office or classroom, and this isn’t going to change any time soon. So the lack of keyboard connector is a big deal, right? I don’t think so. I’ve been happily using an iPad with a Bluetooth keyboard since the iPad 3 launched six years ago. Sure, there’s a little lag compared to a keyboard attached via the smart connector, but it’s still quite usable. 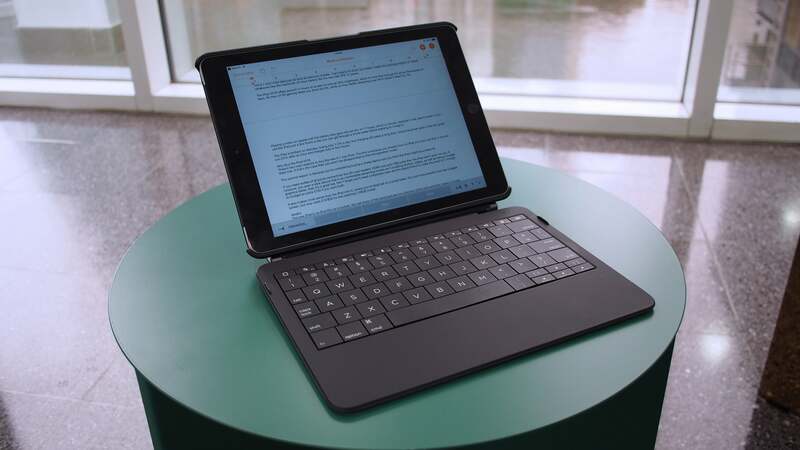 There are dozens of Bluetooth keyboard cases that range in quality and price, and these make the iPad a solid tool for writing emails, essays or just having some ‘civilised debates’ on forums. An on-screen keyboard just doesn’t hack it. The quality of the keyboard makes all the difference. Some cheap keyboards don’t feel great; others add too much bulk. We’ll be reviewing some options soon. I’ve been testing this new iPad with an old Typo Bluetooth keyboard designed for the iPad Air. It fits (just), so if you do have an old keyboard case then you might be able to reuse it. Do note that iPad Air 2 cases won’t fit this new iPad. That tablet was paper-thin. The iPad was hamstrung for years by iOS. Apple’s operating system favoured smaller-screen devices for a long time. 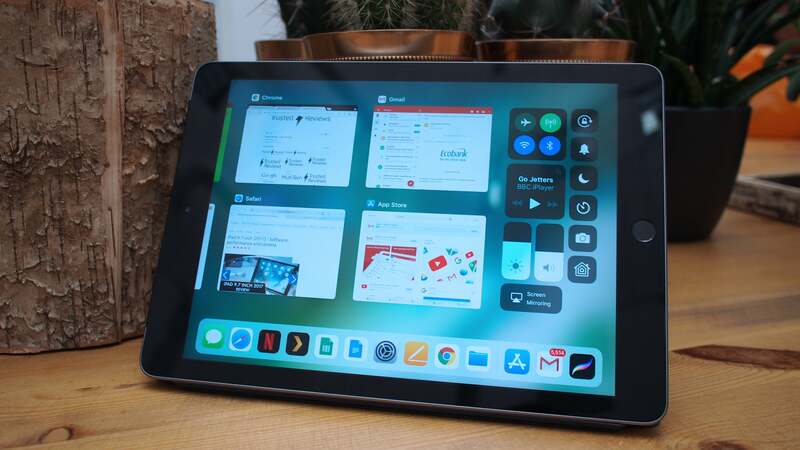 iOS 9 brought with it split-view multi-tasking, which was crucial, but it wasn’t until iOS 11, late in 2017, that the iPad got the love it deserved. 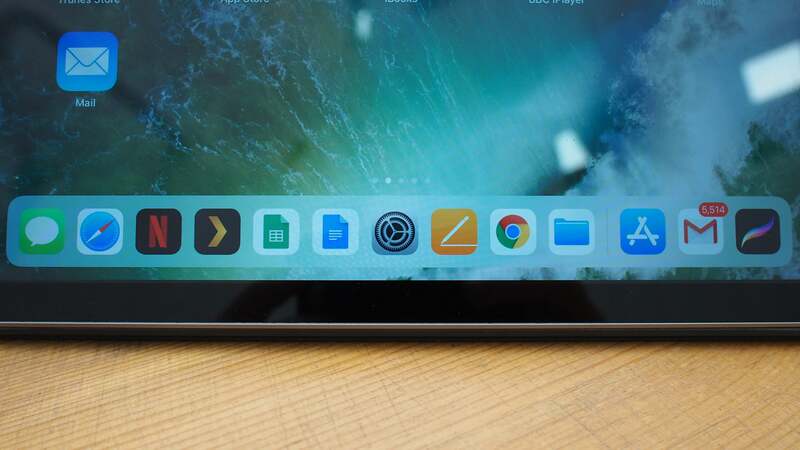 iOS 11 introduced a brand-new interface for the iPad, with a persistent dock for most-used apps, as well as a proper app switcher and a revamped Control Center. It also increased the Pencil’s functionality, so you can now write and draw inline in Mail and Notes. Even better, the iPad can now recognise your handwriting, so you can search your written notes for keywords. These are the changes that really make a difference to viewing the iPad as a true laptop replacement and productivity workhorse. Then there are Pages, Numbers and Keynote. These are Apple’s take on Microsoft Office, except they’re free. They’re arguably more powerful than Google’s free cloud apps, but if, like me, you’re hooked on Google, then those are available too, as is Microsoft Office. Apple keeps touting the 2018 iPad as more powerful than most laptops. How can that be true? How can a device that weighs a few hundred grams and is just 7.5mm thick compete with full-on laptops? Well, if you’ve spent almost £1000 on a laptop recently then you shouldn’t worry – you haven’t been mugged. It will be more powerful and be able to do more than the iPad. The truth is that it’s very hard to compare performance between a laptop running macOS, Chrome or Windows and an iPad. There are some benchmark tests, such as Geekbench 4, which work across platforms and give an indication of comparative performance. 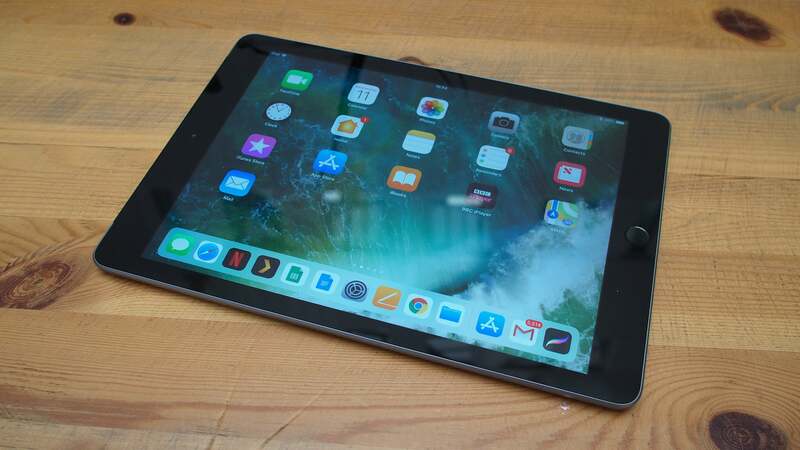 The iPad 2018 emerges looking great using the Geekbench yardstick, thanks to its A10 Fusion processor and 2GB of RAM powering the lighter operating system. Single-core performance is a particular highlight. This is important, since most apps still utilise only one core at a time. I’ve compared it here to last year’s iPad, the iPad Pro with A10X processor, and 2016 Intel i3, i5 and i7 mobile processors packed into most laptops costing £400-£700. Geekbench shows that the A10 outperforms the i3 significantly and the i5 slightly when it comes to single-core performance. In multicore, where both cores are used, Intel manages to claw back some ground. Cross-platform benchmarking is a tricky measurement and shouldn’t be trusted as a sole indicator of performance. A more useful way assessment of performance is to use a similarly priced laptop to run the same tasks: edit images and video, multitask, and play games, for example. Here, again, the iPad comes up smelling of roses. The hardware and apps are so well optimised to iOS that even highly intensive tasks such as editing images and video run more quickly than they would on a £300-400 Windows laptop. A Chromebook won’t pass muster either, but that’s more because Chrome apps are still rather lacking compared to the wealth of the Apple App Store. Editing out an undesirable in a photo of everyone’s favourite redhead is instant on the iPad using the Apple Pencil and the Pixelmator app. A 2014 MacBook Air with an Intel Core i7 and 8GB of RAM has a delay of several seconds using Photoshop for the same task. The results are also better on the iPad. These tests aren’t like for like. I’m not using the same software, but I am seeking the same end result. Editing Full HD video in iMovie is just as slick, and faster than on the old MacBook too. So when it comes to getting things done, clearly the new iPad can compete. When it comes to replacing a full-fat Windows laptop, things become more complex. Power users will miss the multi-tasking abilities of a proper PC. Dragging multiple windows around and having lots of items open on a single screen can be handy. So is a larger screen and keyboard. Regardless of how much sharper the 9.7-inch screen is compared to a similarly priced laptop, the keyboard case is small and a little cramped for my hands. 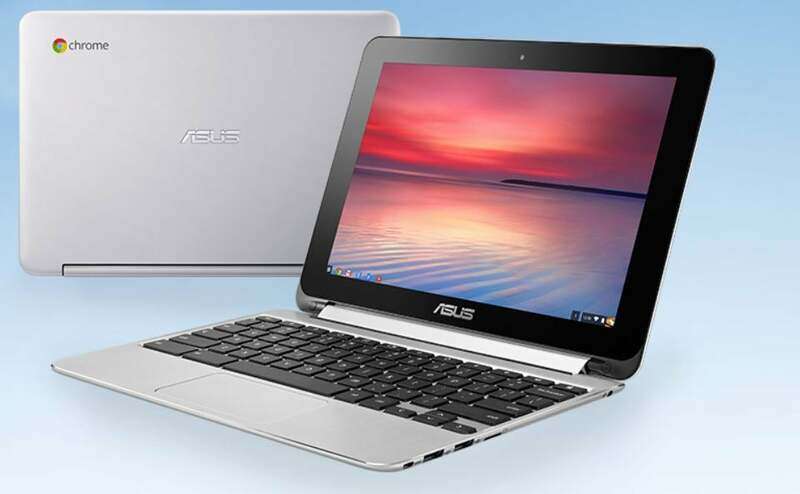 Compare it to a Chromebook and the iPad fares better. For starters, the app ecosystem is so much richer. 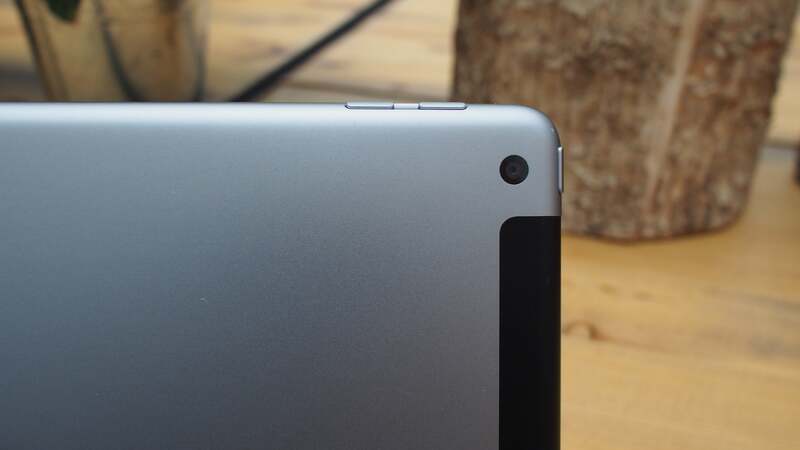 The screen is also sharper than anything you’ll find on a £400 Google-powered laptop. What is missing, however, is a touchpad. A touchpad is a great way of navigating a laptop, so on the iPad you’ll need to use your fingers and the screen, or pick up the Apple Pencil for better precision. You get used to the lack of cursor, but it’s still some way from using a touchpad. So here’s the rub. The iPad does work as a laptop replacement if you buy a decent keyboard case with which to use it. That ups the price to around £400 for the entry-level model. I’d also prefer a larger keyboard and touchpad in the long run, simply because I write so much. The size is a benefit when it comes to children, though. Where an iPad keyboard can feel restrictive to an adult, it’s ideal for smaller fingers, and also light enough for kids to carry around. Apple’s courting of schools and education establishments really does make a lot of sense. The 2018 iPad comes in 32GB (for £319/$329) and 128GB (for £409/$439) versions, with no option to expand later, so choose wisely. You can also get the 4G version for an extra £130 – a high premium. The 8-megapixel camera on the rear of the iPad takes acceptable photos in good light, but is average at best. 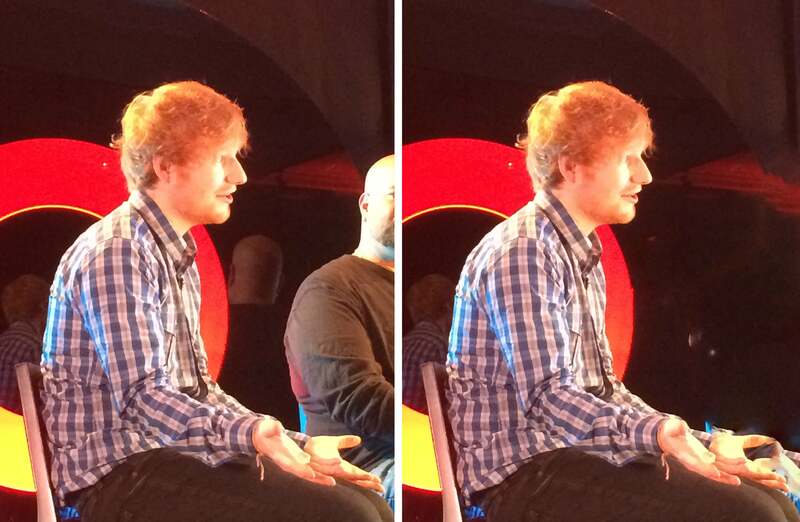 Photos are flat and can be overexposed. In low-light conditions they’re packed with noise. I’d hoped this would be improved over the previous model, but the narrow f/2.4 aperture remains – and it just doesn’t cut it anymore; you can get better pics from some £150 phones. However, you do get Live Photos, which makes a mini-movie out of every image, and the camera shoots Full HD video. It’s perfectly adequate for school projects, but you won’t want to use it to capture cherished memories. The camera isn’t just there for snaps, however. 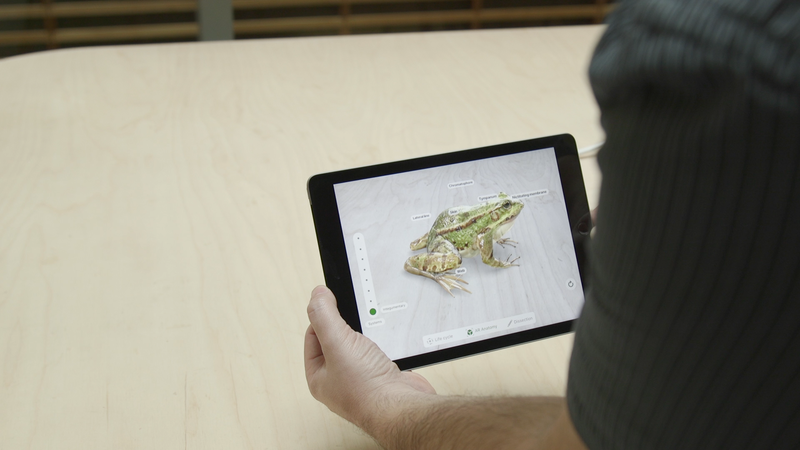 Apple is investing in augmented reality, but the iPad isn’t the best showcase for ARkit. It struggles to find surfaces it can ‘project’ on, and when it does it can be jittery, making you lose focus. AR remains a bit of a gimmick on the iPad, but it will keep kids happy for a short while. If Apple is serious about AR then it needs to pack a 3D sensor or dual cameras on the rear of the iPad to make the experience slicker and more immersive. The 2018 iPad also comes with 1.2-megapixel Facetime HD camera, which works well for video-calling. The 9.7-inch iPad lasts just as long as previous models. That means it’s solid, but doesn’t reach the dizzying heights of newer Ultrabooks, such as the new Dell XPS 13 with its mammoth 20-hour quoted battery life. Of course, prices for that awesome laptop start at £1249. The iPad 2018 offers around 11 hours of screen time at 50% brightness, which is more than enough for all but the busiest of days. An hour of 3D gaming takes it down by 9%, while an hour of Netflix streaming over Wi-Fi cuts it by 7%. Browsing the web consumes about the same amount of power as streaming. Playing a video on repeat until the battery died gave me just shy of 11 hours, which is identical to last year’s model. If you use the iPad for only a few hours a day, you’ll get through a whole week before needing to charge it. The iPad is brilliant on standby, losing only 1-2% per day, but charging still takes a long time. Using the power adapter in the box gives you 25% after an hour; it takes four hours to fully charge the device. Why buy the iPad 2018? There are two main reasons to buy the new 9.7-inch iPad. The first is because you already have an iPad that you love, but it’s old and tired. If that’s the case then you won’t be disappointed by this reinvigorated model. The second reason is because you’re considering buying a cheap laptop and you think the iPad might be a better fit. If you need oodles of physical connectivity such as SD card readers, HDMI outputs and USB ports, the iPad won’t work for you. If, however, you want a slick device that’s as comfortable streaming movies as it is editing photos and videos, as well as being a budget graphics tablet, then it’s a great bet. Don’t forget, however: you’ll need a keyboard case and the Apple Pencil to make the most of it. I’d budget an extra £150 for both. This new iPad also makes more sense than the iPad mini 4, unless you’re dead set on a small tablet. It’s a lot more powerful and has a bigger screen, but only costs an extra £10/$30 for the matching 128GB model. The post 9.7-inch iPad 2018 appeared first on Trusted Reviews.